On the outside it seems simple enough. But this ship must have a mind of its own, tricking you into going the wrong way! Can you find your way through the maze and rescue your crewmates? My first attempt at creating a level in the default 5x5 space, involving warp lines. Admittedly I love to make things in games, even if I don't have the right experience, so this was fun to make. I hope I get time to do this again soon! I might only be a casual fan making these levels, but any flaw you point out or any suggestion you make helps in improving this level, and helps me to gain experience in what not to to when making levels Plus you'll be helping make the level better for everyone involved! Could you please tell me how you came to get stuck? Giving it some thought you might have glitched through a gravity line on the top route on that screen. Or are you trying to get the other crewmate AFTER the one in Future? If so I think I see the issue... whoops That would be a fault on my part. I'll fix that right away! Woah that level was confusing! And slightly annoying. But it was pretty cool. I got 4 out of 5 trinkets, never saw the 5th one. I only found one bug: in "Potential for Gravity", the room kept switching to the "...Anything" screen, flashing back and forth so frequently that eventually I got stuck into the wall. I tried to reproduce the error, and the room stopped switching to the "...Anything" screen. 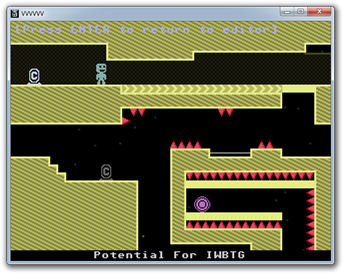 I actually didn't find much wrong with this level, so I can't give much constructive criticism. I really liked the trickery involving the warps on the sides of the rooms, especially in the beginning section. During the level I got kind of confused about whether or not I was going to find all the trinkets, but they turned out to be all in my path after all. Thought the level looked a bit simple, aesthetics-wise, but it didn't bother me and I enjoyed the level nonetheless. The room names were amusing, I liked your naming convention. Actually, I just thought of one thing you could improve. In "Potential for the Future", I think it would look better if you scripted the "Help Me" instead of making it a text box.